A Gallery Grows In Brooklyn. Many galleries have spent time in Williamsburg and Bushwick, Brooklyn. Some, like Pierogi and Factory Fresh have remained while others made the leap across the East River only to meet their own demise the fault of Manhattan rents, such as the beloved 31Grand and Bellwether. 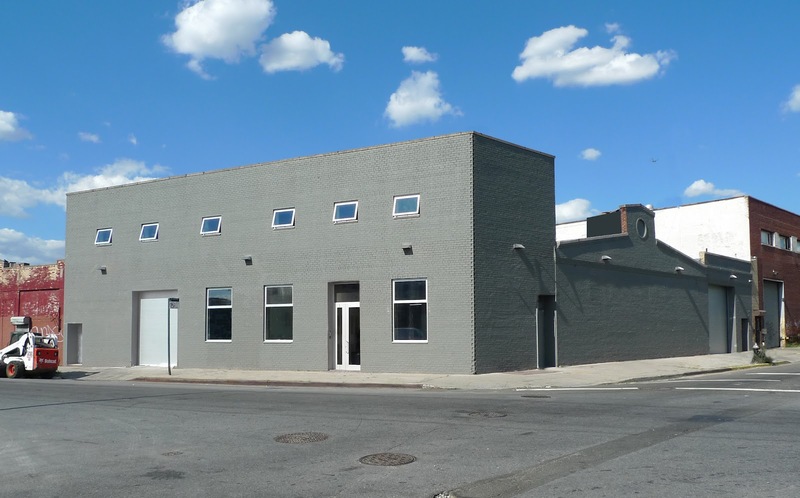 In 2005 the now defunct, but infamous Deitch Projects opened a temporary warehouse space in Williamsburg on North 1st Street, which is where I first discovered the work of the late Dash Snow. The exhibition, titled Live Through This, New York in the Year 2005, also a monograph, was curated by Jeffrey Deitch and Kathy Grayson, who is now director of The Hole. Luhring Augustine has taken a different approach to Brooklyn. Instead of tapping into the scene or hipster youth mentality, they have dropped a bit of Chelsea aesthetic into the factory and warehouse laden streets of Bushwick. In between red brick buildings, incidentally decorated by colorful graffiti, now stands a large gray rectangle, that I assume just like its neighbors, was once red. However, the redesign by Rexrode Chirigos Architects, feels fresh and exciting and the gallery stands as a beacon of possibility for both local artists and art appreciators alike. The building was originally purchased by the gallery for storage space and once it was recognized that some excess space remained, something rare in New York, they collectively decided to open a gallery. A bold move, but welcomed and a refreshing addition to the neighborhood which also recently acquired a clothing boutique featuring the wares of the lovely Mary Meyer. 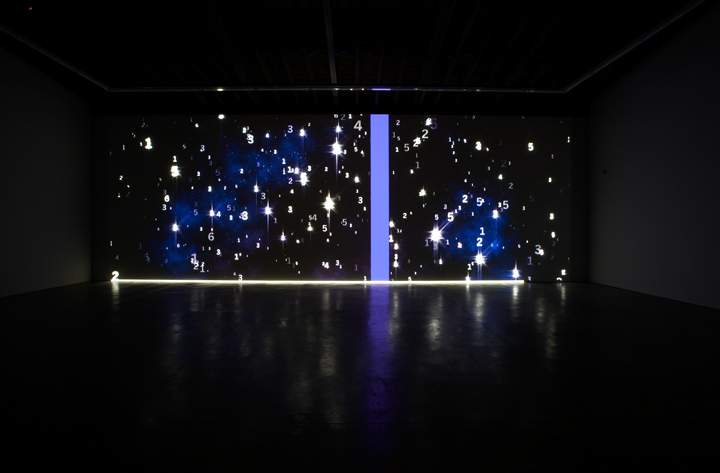 In classy, Luhring Augustine fashion, rather than inaugurate their new Bushwick gallery with an emergent artist, they chose the work of veteran Charles Atlas. Born in St. Louis, Missouri, 1949, Atlas is known for his film making and video art work, having been part of numerous collaborative works for stage, film and television. 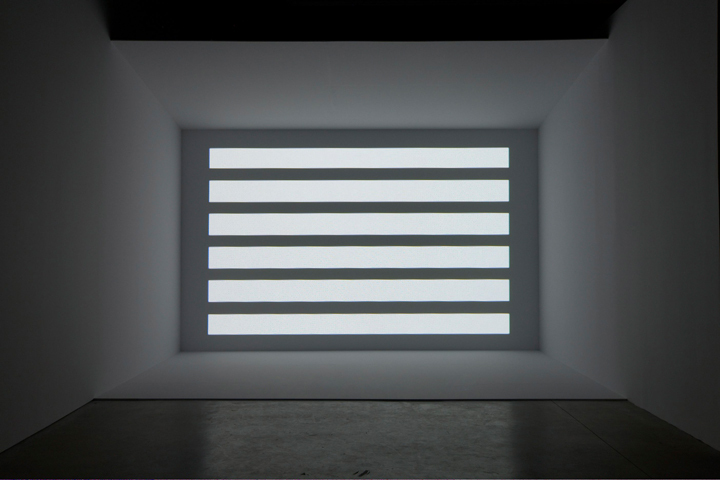 For his exhibition at Luhring Augustine Bushwick, The Illusion of Democracy, he presents an installation of video, one made specifically for the gallery and two which are being shown for the first time in New York, Plato’s Alley, 2008 and Painting by Numbers, 2011. At the time I started making the first of these pieces (Plato’s Alley (2008), my goal was to make a piece that didn’t look like any other work that I had done before. I tried to imagine I was an unknown artist with a different sensibility — realizing of course that on some level it would probably be surprising but still be recognizable as my work by the people who have known my work through the years. My rule for that piece was that I could only use straight lines and numbers, quite the opposite of any of the work I had done up to that point. In the first work [Plato’s Alley] I wanted to make a piece about “number-ness”, something that I thought would exist even if human beings didn’t exist. In the end I was forced to use numerals, but I didn’t want the subject to be about numerals, so I limited the field to 1 through 6. Then in the succeeding pieces I decided to use the same cast of characters, like a repertory company. The concept of numbers as players in a repertory company is the magical link to the success of 143652. The numbers float and scroll across the projected area masters of their own domain. Knowing the background of the artist and his interest in numbers for numbers sake, the theatricality is both subtle and present in the same way that actors or musicians perform an encore or take their final bow of the evening. In The Illusion of Democracy human beings don’t exist and in a truly democratic way, all the numbers appear to get along swimmingly. 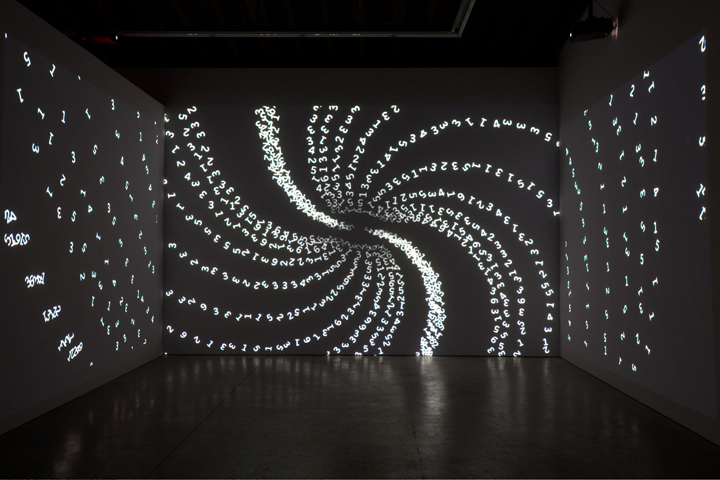 Charles Atlas, The Illusion of Democracy, will be on view at Luhring Augustine, Bushwick until May 20th, 2012. The gallery has yet to plan a program for the rest of the year, and I look forward to what will be the next exhibition!